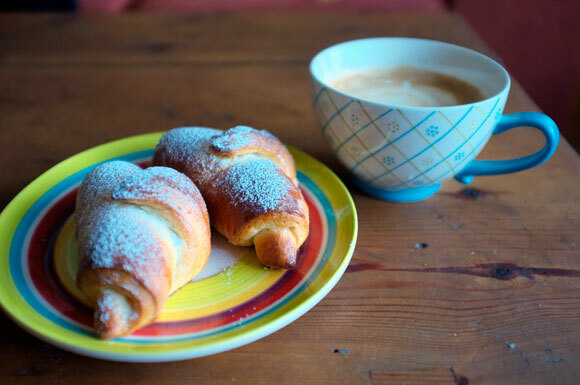 Here you have my ultimate recipe for an Italian croissant, also called cornetti in Italian. Warm up the 150 gr of milk a little bit (c.a. 30ºC), remove from the stove and add the yeast. Mix until it dissolves completely. Set aside. In a large bowl mix 500gr of flour with the 150 gr of sugar. Add the lemon zest. Cut the 50gr butter into small pieces and add it to the mixture. Add 2 eggs and the milk, knead until it does not stick to your fingers. You can either do it by hand or - if you are as lazy as I am - with the help of a stand mixer (I used my lovely KitchenAid with dough hook attachment at medium speed about 10 min.). 1. 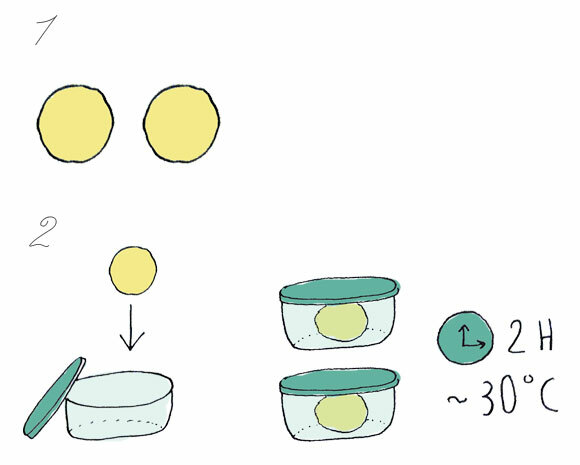 Separate the dough in two parts and make two balls out of it. 2. Put the balls in two airtight containers and let it set for 2 hours at about 30ºC (my home is around 20ºC so I placed the containers in the oven at minimum temperature). 3. Dust one of the balls in flour and roll it into a circle like you will be making pizza. 4. 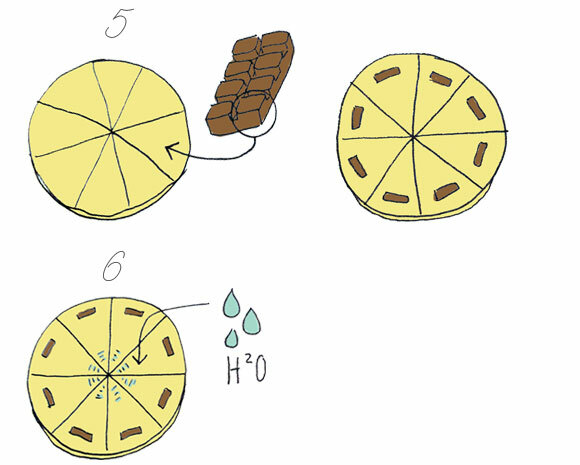 With the help of a sharp knife, cut it into 8 triangle shapes as shown in the picture below. 5. Add a piece of chocolate in the widest part of the triangle. 6. Brush the narrow part of the triangle with a bit of water. 7. Take the bottom of the triangle and tightly roll it up into a croissant shape. Repeat steps 3 to 7 with the other ball of dough. 8. Let them set for 3 more hours at room temperature, leave enough space between the cornetti because they will double its size. You can skip this step if you are planing to freeze them*. 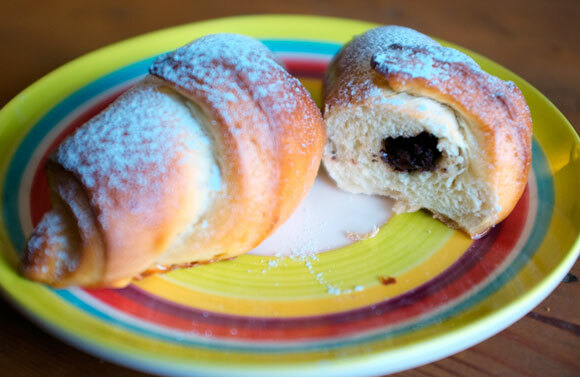 * in that case just put your beautiful cornetti straight to the freezer. 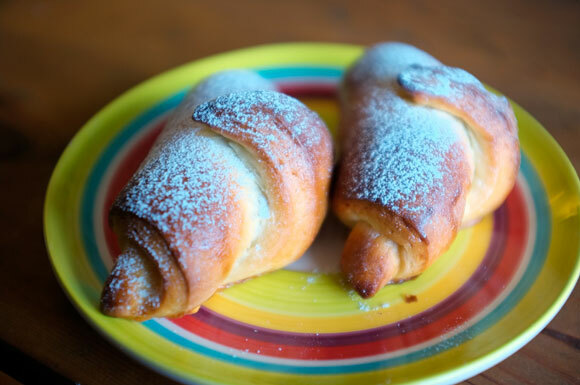 Whenever you feel like eating them, take the frozen cornetti out from the freezer the night before and let them defrost overnight at room temperature. Whisk 1 egg yolk with a bit of milk. Place the cornetti onto the baking tray and brush them all over with the egg mix.